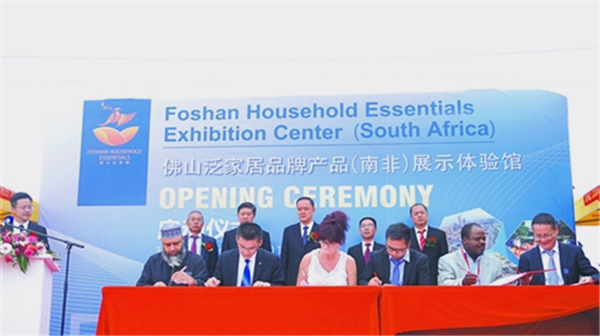 Local time in the morning of December 10, the opening ceremony of Foshan Household Essentials Exhibition Center (South Africa) was held in Johannesburg, South Africa. And in the afternoon of December 7, the opening ceremony of Foshan Household Essentials Exhibition Center (Tanzania) was held in opened in Dar es Salaam, Tanzania. This is the first batch of household Essentials exhibition centers in Africa opened by Foshan. Galanz, Chigo, Kito Ceramic, Weiye Aluminium and other 90 Foshan household essentials enterprises participated in the exhibition. At the opening ceremony, Foshan enterprises in the field of building materials, furniture, electrical appliances, household supplies, hardware and etc. have made fruitful exchanges and negotiations with the local counterparts wholesalers, dealers, manufacturers and so on, and some enterprises also investigated the local professional market for business docking. According to statistics, the volume of trade between Foshan and Africa was 51.8 billion yuan in 2017, accounting for 11.9 percent of Foshan’s total import and export volume. Africa is the third largest import and export market of Foshan. In 2017, Foshan's household essential foreign trade was about 25 billion US $, which accounted for about half of the city's total export value. Su Yan, Director of the Bureau of Commerce of Foshan City, said the establishment of Household Essentials Exhibition Center in Africa would help Foshan's household essential to be built as a whole, opening a breakthrough for Foshan's household essential enterprises to expand deeply into the African market. Relying on long-term display of the exhibition center, enterprises in both places will achieve localized landing of brand launching, sample display, business negotiations and etc., and enterprises can do business in the world without leaving home, which greatly saves the transaction cost and enhances the trade efficiency.